Via PLANetizen and Archnewsnow, here's an excellent LA Times article on Riviera Beach, Florida, where city officials want to use eminent domain to demolish the homes of 6,000 of the town's 32,500 residents to free up lakefront property for a billion dollar yachting/residential development to lure the type of rich old white people (average age: 66.6 years) that now populate Palm Beach, just a few miles to south, where the median home price is over $2,000,000, compared to $290,000 in Riviera Beach. The irony, of course, is that it was the more liberal members of the U.S. Supreme Court who carried the court's recent controversial ruling that the constitution's "nor shall private property be taken for public use, without just compensation" clause gives governments carte blanche to define "public use" pretty much any way they want, even if it means seizing property of the poor and middle class to turn it over to the rich, just to increase the tax base. 60-year-old housepainter Martha Babson sums up the situation succinctly, "What they mean is that the view I have is too good for me, and should go to some millionaire." The Central Loop TIF district alone generates nearly $90,000,000 annually, although, with this month's groundbreaking at the long dormant Block 37 and two large condo towers going up just down the street, the Loop can no longer be considered a depressed area. The city has become adept in expanding how TIF money can used. Large amounts of TIF money went into the development of Millennium Park, even though it falls just outside the Central Loop TIF's boundaries. According to Hinz, about $30,000,000 a year of TIF money has been used to fund new school construction. TIF money may have already become an addiction. Even developers in booming areas like the South Loop expect - and get - dollops of TIF cash to aid their projects. The time to be subsidizing development is when there isn't any, not when we're in the midst of the hottest real estate market in memory. 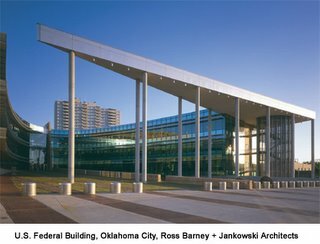 All government programs have a tendency to become self-perpetuating, and TIF's are no exception. The Central Loop TIF is scheduled to expire in 2007, and whether or not it's allowed to die offers up a clear test: will the city have the discipline to turn off the spigot, or will TIF's just become an enormous, perpetual goody-bag for dispensing favor? In the case of successful TIF's like the Central Loop, the best thing to do is declare victory and move on. 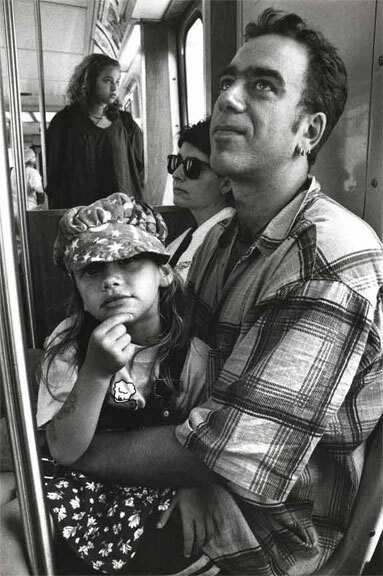 Via Archidose and Gaper's Block, here's a link to a great website, The Beautiful People Take the Red Line, by Howard Blume, self-described Paparazzi to the people. It consists of three selections of shots of people riding Chicago's Red Line "L". A subway car is a kind of psychic museum of the way we live within our own private selves, pockets of being hermetically segregated from an often densely packed community of others that we share the space with. The last gallery breaks the wall - the subjects are now aware they're being photographed: consciously public, directly engaged but increasingly guarded, their reactions devolving into a vastly smaller repertoire of expected behavior . . . To prepare a face to meet the faces that you meet . . .
And at once the vicissitudes of life had become indifferent to me, its disasters innocuous, its brevity illusory - this new sensation having had on me the effect which love has of filling me with a precious essence; or rather this essence was not in me it was me. I had ceased now to feel mediocre, contingent, mortal. Whence could it have come to me, this all-powerful joy? I sensed that it was connected with the taste of the tea and the cake, but that it infinitely transcended those savours, could, no, indeed, be of the same nature. Whence did it come? What did it mean? How could I seize and apprehend it? - Marcel Proust, in Ã La Recherche du Temps Perdu on his encounter with a madeleine. For as long as anyone remembers, one of the great unexpected pleasures of living or working on the periphery of Chicago's Loop was the strong aroma of chocolate suddenly wafting mysteriously through the air. Now, this singular delight is about to meet a brutish end. The countless many who loved it have been outnumbered by a disdainful one, slithering furtively to the EPA with a formal complaint against the scentgiver, the Blommer Chocolate Company, which has been processing cocoa beans in its Kinzie Street factory for sixty-six years. 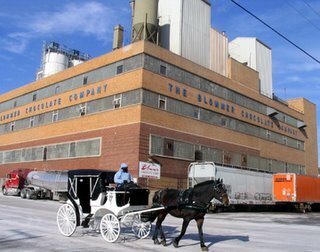 With singular and relentless obtuseness, the EPA has now put the strong-arm on Blommer to protect the "children, the elderly and people with heart and lung diseases" from the pernicious effects of inhaling cocoa dust, by installing equipment that will banish it from the air forever. What's next? Putting the screws to bakeries to eliminate whatever particulate produces the aroma of fresh-baked bread? In reply, I can only paraphrase the response to the mania of another bureaucracy, the FDA, as it "protects" us from the supposed peril of prescription drugs imported from Canada, "Show me the dead chocolate sniffers." 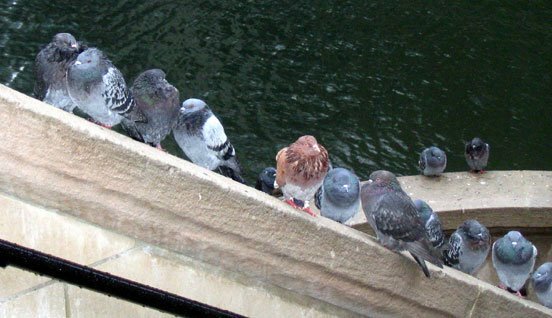 Show me the helpless urchins, weezing invalids and lovable grandmothers brought low by Blommer's romantic emissions. I suggest to you, sir, that you cannot, because they do not exist. Old, young or infirm, place any of them within the power of that sweetly dense scent, and I submit you will witness neither consternation nor concern, but only an unforced smile. Six decades of pleasure, gone in an instant via a desk jockey's decree, the long, cold winter hard upon us, and aromatic respite snatched away, never to return. It's almost enough to turn one into a libertarian. Australian architect Ed Chew has tipped me off to his offbeat website, ArchQuotes.info, which, appropriately, offers up a regular dose of quotes from prominent architects from around the world. This week, it includes quotes from such diverse practioners as Ken Yeang, Frank Gehry and Alvar Aalto. 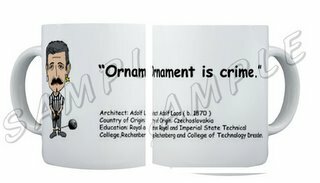 Another section of the site offers up Chew's trademarked ArchiMuqz, small or large coffee mags with a caricature of and quote from a famous architect. (Dishwasher and microwave safe!) Although the collection includes the usual international suspects like Gehry, Wright and Libeskind, it also has a specific Asian emphasis, with mugs for Kisho Kurokawa (Kuala Lumpur International Airport,) and with Norman Foster having separate mugs for the HKIA airport and the HSBC Tower in Hong Kong. I haven't ordered anything from this site yet, and I'm not freakin Consumer Reports, so if you wind up having complaints, don't come crying back to me. 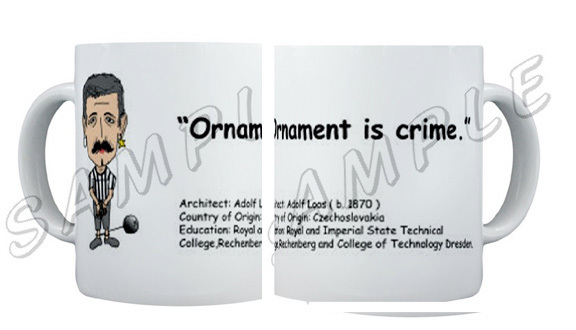 But if there's a certain someone on your list who's pining for an Adolf Loos Ornament is Crime coffee mug for Christmas, Ed Chew may be your go-to guy. The holidays aren't slowing down architecture-related events in Chicago this December. The Gene Siskel Film Center is sponsoring a mini-festival of three films - on Antonio Gaudi, Louis Sullivan and Frank Lloyd Wright in Japan. There are conferences on Structural Engineering and making affordable construction green and sustainable. There's Archeworks fall critique. There are lectures by Mark Sexton, Steven Holl, Robert Bruegman on sprawl, Charlie Lazor on his Flatpak House, and and the always provocative Dan Wheeler. Add in lunchtime lectures on the Loop's houses of worship, the Illinois Central Railroad's impact on the lakefront, and a discussion of the Tiffany Domes of the Chicago Cultural Center, and you'll find no shortage of choices to supplement your holiday shopping and final visit to Marshall Fields before it disappears under the smothering mantle of Macy's. Look over all of Decembers events here. The Brookings Institution has just issued a new report, Who Lives Downtown, that tracks the growth pattern of the downtowns of American cities over the last three decades. While the 45 downtowns tracked in the study from 1970 to 2000 had a net gain of only 35,0000 housing units, Chicago's downtown alone has grown by over 20,000 residents, a 39.4% gain, to a total of 72,843. Chicago's downtown has the highest rate of home ownership among the 45 cities surveyed - over 18,000 of the 44,638 housing units are owner-occupied. In all downtowns surveyed, the fastest growing segment is adults 25 to 34, while people over 65 and under 18 represent the biggest decline. 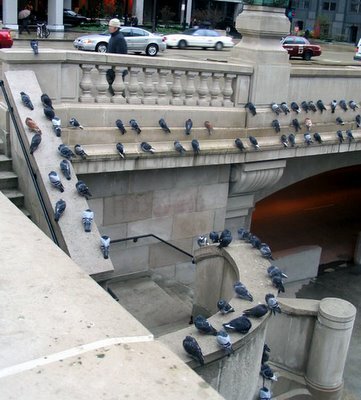 Chicago's downtown is also very integrated compared to our cities. The only one of the survey's lists of the ten most and least white, black hispanic or Asian downtowns that Chicago appears on is that for Asian's, who comprise 8.4% of our downtown population - in Lower Manhattan, Asian's share of population is 41.8%. 67.6% of Chicago's downtown residents have at least a bachelor's degree, bested only by Midtown Manhattan's 71.5%. Lest we become complacent, however, during the same period that America's downtowns added 35,000 people, our suburbs gained 13,000,000. 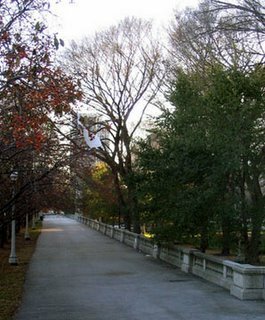 Is a franchised Hollywood-style Walk of Fame just the ticket for an underutilized portion of Chicago's Grant Park? Read all about it here. 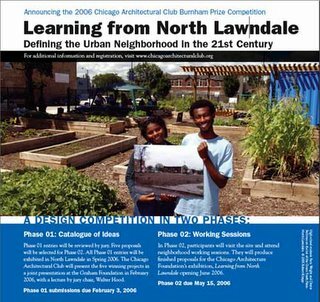 The Chicago Architectural Club has announced the theme for the 2006 Burnham Prize Competition: Learning from North Lawndale - Defining the Urban Neighborhood in the 21st Century. There is no specific program, but addresses the challenge of North Lawndale's 5,000 vacant lots, half of them owned by the City of Chicago. The competition seeks entrees "that address these lots or the or the urban fabric in-between." Registration closes on January 20, 2006, and Phase One entries will be due next February 3rd. The first round jury, to be chaired by landscape architect Walter Hood and including architect Kerl Lejeune of Booth/Hanson and a balance of members to be named later, will narrow the entries down to five finalists. Second phase entries will be due May 15, 2006. The prize for the winner is an extended fellowship at the American Academy in Rome for the Fall of 2006. Full information, including program, materials and download, can be found on the CAC's website here. Neat new guide to Chicago's Public Art - and its free! The Chicago Department of Cultural Affairs, with the sponsorship of the Chicago Office of Tourism, has issued a rather splendid free publication, The Chicago Public Art Guide. 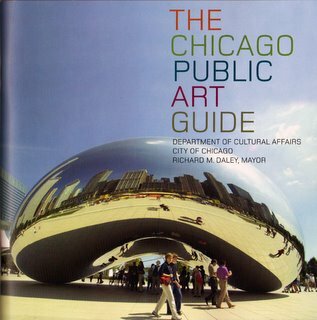 The 80-page publication is a treasure trove of information on everything from the Picasso Statute in Daley Plaza, to artwork in the parks, at the airports and in the neighborhoods. If you've ever wondered where to find a Henry Moore sundial (try Sundial: Man Enters the Cosmos right by the Planetarium) or who designed the seahorses at Buckingham Fountain (Marcel Francois Loyau), you can find it all here, with lots of photographs - all color - in an easy to carry format, which includes an attached fold-out map of artworks in the Greater Loop area. The profiles of the artworks are somewhat sanitized - the extended entry on the Haymarket memorial doesn't mention that previous memorials were blown up by 60's radicals, and the description for Milton Horn's Chicago Rising From the Lake leaves out the great story of how it was lost after the Wacker Drive parking garage for which was created was torn down, only to be found decades later in a trash dump, restored and remounted along Chicago's riverwalk. Still, this is the kind of overview that usually exists only in expensive coffee table books, and you can get it for free. I found my copy in the Visitors Center at the Chicago Cultural Center. It may or may not have been distributed to the city's other libraries - my contact at Cultural Affairs wasn't sure - but you can also call The Department of Cultural Affairs at 312/742.1156 to request a copy. It's well worth looking for. Five Architects, the Chicago Architecture Foundation exhibition showcasing the midwest projects of five women architects including Jeanne Gang, Carol Ross Barney, Julie Snow, Sejima Kazuyo and Zaha Hadid, is in its final week, closing on November 20th. “We don't know if women think differently than men, and we may not know it for a long time," architect Denise Scott Brown has said. In Designing Women, I look at women architects' long battle to make their way in a traditionally boy's-only-club, and considers how their presence is changing the face of architecture. Read about it here. After a long gestation, Preservation Chicago, the city's grassroots preservation organization, has unveiled its new web site, just in time to cover the group's November 9th announcement of its 2006 list of The Chicago Seven, Chicago's Seven Most Endangered Buildings. The new list includes DePaul's Hayes-Healy Center, scheduled to be demolished for the CTA's rehab of the Fullerton Brown/Red Line Station, and the William LeBaron Jenney's New York Life Building on LaSalle, which stands to be substantially gutted for a new 50 story tower. The new site offers a handsome design and a wealth of information. 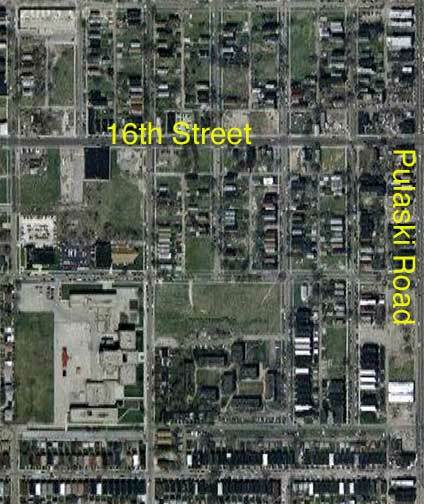 It provides a very thorough picture of the perils and posibilities of preserving Chicago's historic buildings. The only drawback I could find is the use of PDF's, rather than HTML, for descriptions of each entry on the Chicago Seven List. It's especially frank in talking both about the buildings they've failed to save as well as their many successes. 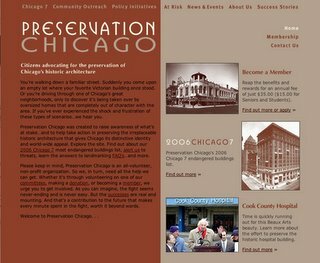 There's always a concern about whether a site will be kept fresh and updated, but right now the Preservation Chicago website has become an indispensible addition to Chicago's architectural presence on the web. Wednesday, November 9th. Tonight's panel at the Chicago Architecture Foundation with Jeanne Gang, Carol Ross Barney and Elva Rubio has been cancelled. Five Architects, however - the arresting exhibition that they all participated in along with Zahad Hadid, Julie Snow, and Kazuyo Sejima, continues at the CAF through November 20th. Marion Mahony Griffin: Drawing the Form of Nature, an exhibition at Evanston's Block Museum, brings the work and career of Marion Mahony, the first woman to be licensed as an architect, out of the shadow of her collaborators Frank Lloyd Wright and Walter Burley Griffin. Read all about her remarkable career and rediscovered legacy here. Predock Winner of Kroc Corps Community Center Competition? The formal announcement is still awaiting coordination with the city of Chicago, but one unconfirmed report says Antoine Predock, the winning architect for a recent competition to build the Canadian Museum for Human Rights, has also won the competition to design the Salvation Army's new $60 to $70 million Ray and Joan Kroc Corps Community Center at 47th and State Street in Chicago. If it's true, you heard it here first. If it's not true, abject apologies in advance. Effective today, November 1st, the architectural firm previously known as Lohan Caprile Goettsch Architects has officially been rechristened Goettsch Partners, taking the name of James Goettsch, the long-time Chicago architect who spent two decades with C.F. Murphy-Murphy/Jahn in the 70's and 80's before joining his present firm, which traces its lineage back to the original offices of Mies van der Rohe. The name change follows the 2004 departure from the firm of Dirk Lohan, Mies's grandson, to form Lohan Anderson LLC, and the surprise resignation last month of co-President Joseph Caprile. Goettsch is one of six principals who will run the firm that includes James Zheng, who has moved up from Associate Principal. Let's hope the business cards and stationary arrived on time - the company's web site continues to feature the Lohan Caprile Goettsch name. The firm latest completed project is 111 S. Wacker, for the John Buck Company, which it claims as "the world’s first high-rise certified LEED-CS Gold." An interesting article in The Chief Engineer details some of structures most prominent features, including a 44-foot-high lobby ceiling formed by the underside of a parking ramp, and a floating foundation poured over the cassions of the old U.S. Gypsum building, a handsome Perkins & Will structure, turned 45 degrees on its site, that has the unfortunate distinction of being the first modern skyscraper to be demolished in Chicago, replaced in 1993 by a surface parking lot. In a post 9-11 move, 111 S. Wacker has stairs that transfer away from the core at the 10th floor, not to the lobby, but to a perimeter exit. There's a separate entrance for fire and emergency workers and equipment. The final component enabling the LEED certification is a green roof planted with wild-growing grasses. 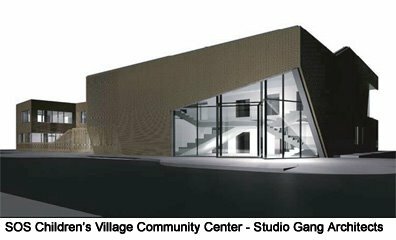 According to Jennifer Mannhard, competition project manager at StastnyBrun Architects, Inc., the jury has met and picked a winner for the competition to design the Salvation Army's new $60 to $70 million Ray and Joan Kroc Corps Community Center at 47th and State Street in Chicago. Mannhard expects the winner to be named once plans for the official announcement are worked out with the office of Mayor Richard M. Daley, hopefully in the next few weeks. The four finalists include Chicago firms Murphy/Jahn, and Ross Barney + Jankowski, as well as Antoine Predock and Behnisch Architects.